C1423. 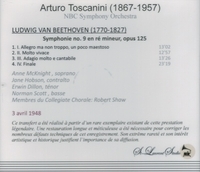 ARTURO TOSCANINI Cond. NBC S.O., w.Anne McKnight [Anna de Cavalieri], Jane Hobson, Erwin Dillon & Norman Scott; Robert Shaw Cond. Collegiate Chorale: Choral Symphony #9 in d (Beethoven), Live Performance, 3 April, 1948. (Canada) St Laurent Studio YSL 78-324, (from an original Mary Howard acetate recording). Transfers by Yves St Laurent. “A native of Aurora, Illinois, Anne McKnight made her official début in 1946, as Musetta in the NBC Symphony's Concert Version of LA BOHÈME, with Licia Albanese and Jan Peerce, conducted by Arturo Toscanini. Two years later, she sang in Beethoven's Ninth Symphony [above] under the Maestro. McKnight opened the 1952 Fall Season of the New York City Opera, in the title role of TOSCA, followed by the title role in AÏDA, both conducted by Tullio Serafin. In 1953, the soprano sang there again in TOSCA (now led by Julius Rudel), DON GIOVANNI (as Donna Elvira, opposite Walter Cassel), AÏDA again, DER ROSENKAVALIER (as the Marschallin), and LE NOZZE DI FIGARO (as the Contessa). She then began a career in Italy, under the name Anna de Cavalieri, appearing at the Teatro di San Carlo (as Busoni's Turandot and Gluck's Alceste, and as Asteria in Boito's NERONE), Teatro alla Scala (Alfano's CYRANO DE BERGERAC, and as Elena in MEFISTOFELE), Rome Opera, Caracalla (LORELEY), Arena di Verona (AÏDA), and Teatro Regio (Parma). In 1960, the soprano returned to the City Opera, as Anne McKnight, for the ‘professional’ American premiere of Dallapiccola's IL PRIGIONIERO, opposite Norman Treigle and Richard Cassilly, conducted by Leopold Stokowski. Later that season, she sang again the Marschallin with the company. She continued her international career at Rio de Janeiro (Puccini's TURANDOT and TOSCA), Piacenza, Rovigo, Brussels, Cremona (Fedora), Toulouse (NORMA), and, in 1968, Padua (TOSCA). McKnight died on 29 August, 2012, at the age of eighty-eight, at her home in Lugano, Switzerland. Jane Hobson was born on 17 March, 1918 in Murray, Nebraska, as Flora Jane Boedeker. She went to to Paris, France, where she studied with Camille Decreus and Robert Casadesus at the American Conservatory at Fontainebleau and obtained a Diplome d’Execution in Piano. She was encouraged to begin voice training, completing four years of studies under under Evan Evans (1942-1946) on a fellowship at the Juilliard School of Music in New York. This training culminated in the receipt of the prestigious Walter W. Naumburg Foundation Prize and a concert at Town Hall in New York City in 1946. Beginning in 1948, under the auspices of Columbia Artists Management she appeared extensively in leading cities throughout the USA and Canadas. She continued to appear with such major orchestras as the Pittsburgh Symphony Orchestra, Chicago Orchestra, Saint Louis Symphony Orchestra, National Symphony Orchestra, and Philadelphia Orchestra. Perhaps her most notable association was with George Szell and the Cleveland Orchestra, with whom she performed on numerous occasions Beethoven’s Ninth Symphony. She appeared with Leopold Stokowski at Carnegie Hall in Debussy's BLESSED DAMOZEL in 1948, and when she sang in Beethoven's Ninth Symphony with the NBC Symphony Orchestra under Arturo Toscanini in the same year [above]. She died unexpectedly on 28 July, 1984. Irwin Dillon was born on 18 August, 1907 in Toronto, Canada. A graduate of University of Toronto and New York University, he became a leading tenor with New York City Opera in the '40s under Lazlo Halasz after years of touring Canada and U.S. with leading Oratorio societies and numerous radio performances. He sang with Columbia Concerts 1944 to 1945. At New York City Opera he sang Don José in CARMEN, Turiddu in CAVALLERIA RUSTICANA and Pinkerton to Camilla Williams in MADAMA BUTTERFLY. His many concert conductors included Dorati, Leinsdorf, von Karajan, Stokowski, Toscanini and Rodzinski. In 1947 he sang three historic performances of ELEKTRA with Marjorie Lawrence-her first performance standing after a six-year battle with polio. 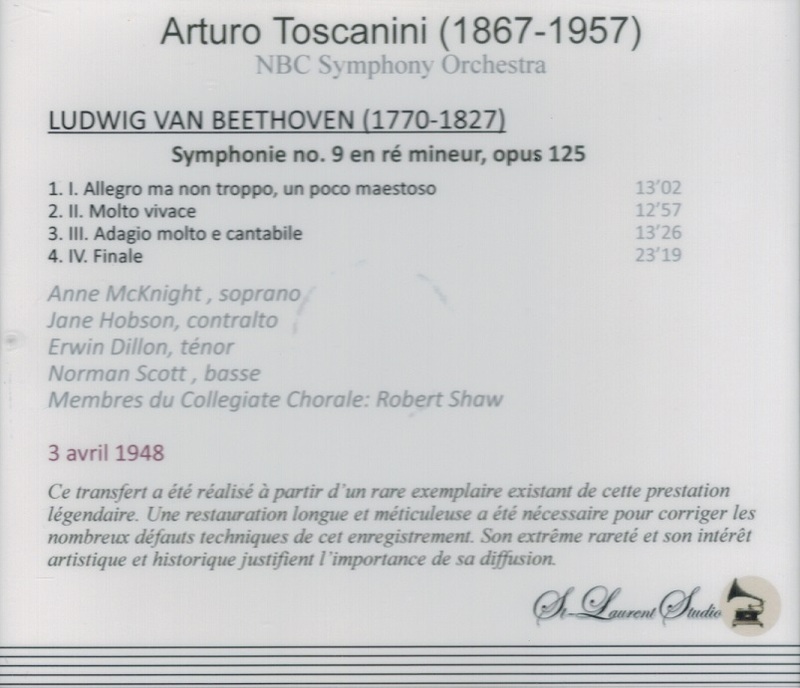 On 3 April, 1948, he sang Beethoven's Ninth Symphony with the NBC Symphony televised [above]. His final performances of WOZZECK were in October 1952 at NYCO. He died on 13 January, 2003 in Mission Viejo, California. 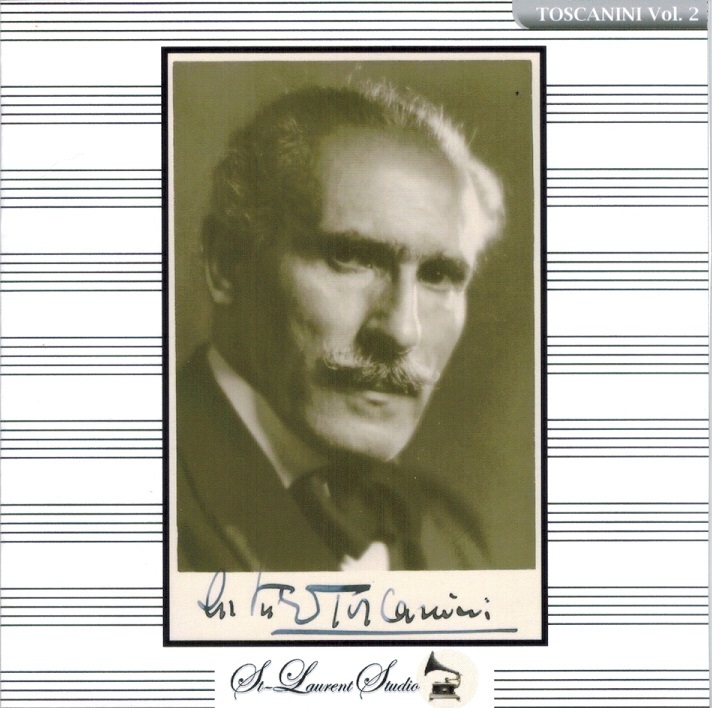 “Few orchestral conductors have attained the public recognition accorded Arturo Toscanini, due in part to his many recordings and frequent broadcast performances, but also to his dedication to the art of music-making. In a career spanning 68 years, he did more than anyone to revive the popular image of the all-powerful maestro.